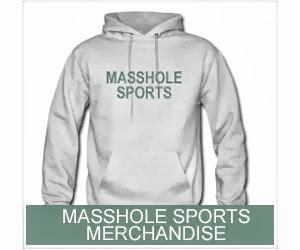 Masshole Sports: Oh My God, Ray Lewis Needs To STFU. “When we — the first time we created something called a tuck rule, it’s the only reason we know — I’m just being honest! — the only reason we know who Tom Brady is, because of a tuck rule! There’s no such thing as a tuck rule! If the ball is in your hand, and I knock it out your hand, whether it’s going backwards, forwards, lateral, sideways, however it’s coming out, that’s a freaking fumble! 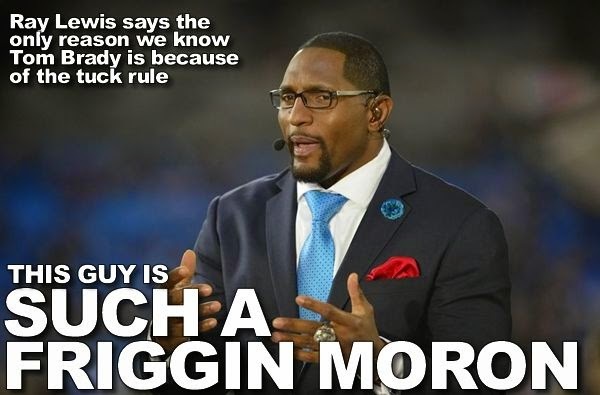 First of all, if Ray Lewis really believes that then he is the dumbest "football analyst" in the history of the profession. Secondly, I don't understand why he is so butthurt. It's not like Tom Brady got away with murder or something.